Susan L. Marquis. I Am Not a Tractor! How Florida Farmworkers Took on the Fast Food Giants and Won. ILR Press, 2017. Susan Marquis is the Dean of the Pardee RAND Graduate School and an unlikely person to be writing this book. Her background is in military defense, which she describes as “guns and bombs” (her previous book was Unconventional Warfare: Rebuilding US Special Operations Forces). As she explains, it was inspired by Barry Estabrook’s article in Gourmet about the harsh treatment of tomato pickers in Florida, later incorporated into his superb book, Tomatoland. Estabrook blurbs her book (“detailed, academically rigorous, and impossible to put down”). I agree. The book tells the story of how the Coalition of Immokalee Workers fought for higher pay and, after much struggle, got it. Here’s how to find out what it took to get retailers like Walmart and Ahold to agree to pay one cent more per pound—and what a difference that made. I am a long-time reader of Science Magazine and every now and then come across an article I just love. As any grower of backyard (or, in my case, terrace) tomatoes can tell you, the most delicious tomatoes wonderfully balance sweetness, acidity, and flavor. To correct this problem, they identified flavor-associated chemicals in 398 modern, heirloom, and wild tomato varieties. These chemicals are present in minute (picomolar, nanomolar) amounts and hard to identify. Modern commercial varieties contain significantly lower amounts of many of these important flavor chemicals than older varieties. The investigators also identified the genes responsible for sugars, acids, and volatiles. A total of 13 flavor-associated volatiles were significantly reduced in modern varieties relative to heirloom varieties. Volatile chemicals define the unique flavor of a tomato and are essential for consumer liking. Thus, poor flavor of modern varieties can largely be attributed to the dilution of many flavor volatiles that positively influence liking. This dilution of flavor chemicals should be correctable by reintroducing superior alleles of genes controlling their synthesis. Analysis of [genetic] loci impacting sugar content provides a cautionary tale regarding crop domestication and improvement. We identified two loci …that have significant associations with glucose and fructose content on chromosomes 9 and 11 …Both of these loci are located within regions previously identified as being within both domestication and improvement sweeps, indicating early and continued selection for larger fruit…Taken together, the negative correlation between fruit weight and sugar content in S. lycopersicum is likely associated with the loss of the high-sugar alleles during domestication and improvement as ever-larger fruits were selected.. Translation: Tomatoes bred to be bigger have less sugar. Smaller tomatoes are sweeter . Grow cherry tomatoes (Sun Golds—yum). Here’s one of the illustrations, in this case showing the variation in genes for certain flavor chemicals in various kinds of tomatoes. I thought you might like to see this billboard…Note the snow on the street since I took this photo a couple days ago. This is part of why the public is so ill-informed about where and how food is produced. Postscript: Daniel Bowman Simon writes: “This appears to be an ad for Bushel Boy, a year-round greenhouse tomato growing operation in MN.” He also sends this link to a story in Crain’s about how Bushel Boy is financed. The big news last week—and it is very big news—is that Walmart has signed on to the Coalition of Immokalee Workers’ (CIW) Fair Food Program. Under this program, Walmart agrees to pay Florida tomato pickers one penny more for each pound harvested — and says it will apply that premium to other fresh produce sold by the chain. A penny a pound may not sound like much, especially since Walmart took in $466 billion in revenue last year. But it means that workers who are now paid 50 cents for a 32-pound basket will get 82 cents, and their wages can go from $50 to $90 dollars a day. Late Thursday, CIW netted the biggest fish of all: Walmart, by far the largest private food buyer in the US. A company that muscled its way to the top of the US corporate heap by pinching pennies—squeezing suppliers and its own workers relentlessly—has now agreed to shell out an extra penny per pound for tomatoes. CIW has shown yet again that scrappy workers, sufficiently organized, can win concessions from even the most ruthless companies. The struggle for labor justice in the fields of the United States—and perhaps far beyond—took an historic stride forward yesterday. At a folding table in a metal-clad produce packing shed beside a tomato field in southwestern Florida, two high-ranking executives from the giant retailer Walmart, which sells more groceries than any other company in the world, sat down beside two Mexican farmworkers and signed an agreement to join the Fair Food Program…The implications of the Walmart decision cannot be understated. Enormous pressure will be placed on competing grocery giants to follow Walmart’s lead. Food Chemical News (FCN) reports today that the USDA has sent its final rules on nutrition standards for school lunches and breakfasts to the Office of Management and Budget for approval. The final content of what got submitted is not known. These rules, you may recall from previous posts, are based on recommendations of the Institute of Medicine in a 2009 report on School Meals. Limits on starchy vegetables to two servings a week. As I noted a few days ago, the Senate passed an amendment to the USDA’s appropriations bill to block any restrictions on potatoes. Most observers think this means that unlimited potatoes will stay in the school meals. Does the Senate think this can pass the laugh test? An additional proposed change in crediting policy would allow vegetable and fruit concentrates to be credited on a single-strength reconstituted basis rather than on the basis of the actual volume as served. For example, one tablespoon of tomato paste could be credited as 1/4 cup single-strength tomato juice. Previously, it was only credited as 1 tablespoon, the volume as served (Federal Register 9-4-81). The press had a field day. 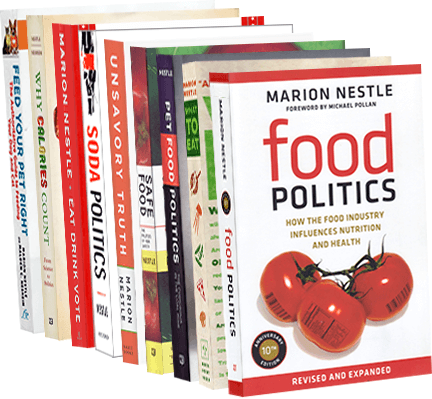 The ensuing bipartisan hilarity and what Nutrition Action (November 1981) called a “maelstorm of criticism from Congress, the press, and the public alike” induced the USDA to rescind the rules one month later. Times have changed. Senators used to have the health of American school children in mind. Now, they undermine efforts by USDA to improve meals for kids. The Senate’s action has nothing to do with public health and everything to do with political posturing and caving in to lobbyists. The Senate should reconsider its actions. The USDA should not back down on this one. As readers know, I love to collect reasons for the sharp increase in food prices that has occurred this year. Here’s a new one: price fixing. Although you might not know it from looking at the similar prices of food products in the same category, price fixing is illegal. Federal prosecutors are apparently looking into price collusion in the tomato industry (according to the Associated Press) and egg industry (Wall Street Journal). Who knew? So it wasn’t tomatoes; it was a jalapeno pepper (maybe). Congress wants to know what took the FDA so long and why the Florida tomato industry got creamed in the process. But every proverbial cloud has a silver lining: the food industry wants more regulation. It’s about time. They finally figured out that a stronger FDA would be good for business. Look what it took to teach them this lesson! Not a pretty sight. Yesterday, July 3, Jim Prevor, the Perishable Pundit, published a long series of posts (his ninth collection) on the tomato recalls. One of the last in this bunch is in response to some comments I sent him. We disagree about a number of points. But if it were easy to achieve safe food, we’d have it by now. I think it’s great that people like Jim are thinking seriously about these issues. See what you think of this debate.